Offering you a complete choice of products which include oil circulating lubrication system. LUBROTECH ENGINEERS, established in 2001 with the aim to provide Total solution for Lubrication & Hydraulic for all application with complete erection and commissioning at sites. 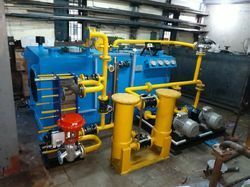 The experience list consists of successful Installation and Commissioning of Equipments and piping of all type of Lubrication & Hydraulic as per design and parameter of customer. The Company has a team of well qualified and experienced engineers & supervisors for project management and project execution. The continued patronage of leading companies in the industries Like BHARAJ MACHINERIES, BAINITE MACHINE, HINDUSTAN RUBBERS,BRIDGESTONE TYRES,ZENITH RUBBER,G G ENGINEERING,TRIMECH MACHINERY,LARSEN & TOUBRO, GODREJ, ATLAS COPCO,CONCAST INDIA, DANIELI INDIA,SIEMENS VIA, CINCINNATI, SOUTH WEST PORT LTD, MAHINDRA, PARLE PRODUCTS, MUKAND LTD, NRB BEARINGS, JINDAL STAINLESS LTD., MALWA SPONGE IRON LTD., DEV AGRO FIBERS LTD., STAR WIRE INDIA LTD., JAISU SHIPPING CO.PVT.LTD., WELSPUN GUJARAT STAHL ROHREN LTD. ETC. Looking for Oil Circulating System For Steel Plant ?